Earlier this year, I had the opportunity to interview one of Rolling Stone’s 10 New Artists That You Need to Know: Magic Giant. 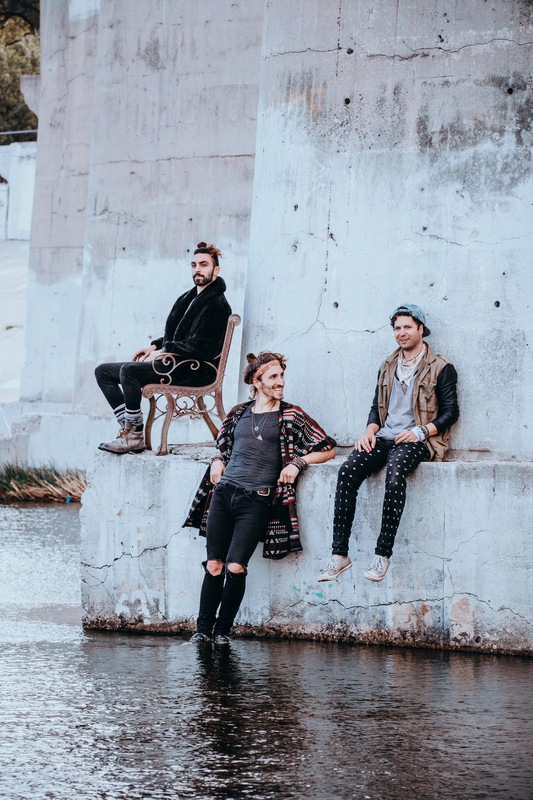 Made up of frontman Austin Bisnow, banjo player Zambricki Li, and guitarist/cellist Brian “Zang” Zaghi, the Los Angeles trio have caught the attention of numerous media outlets such as ABC News and PopMatters. Also, iconic radio personality Elvis Duran selected Magic Giant as his May Artist of the Month and invited them to perform their single, “Set on Fire,” on Hoda and Kathie Lee’s hour of The TODAY Show. Magic Giant brought their summer tour to Kansas City’s Riot Room and dozens of Kansas Citians came to the Westport-based bar to check out this rising band. I heard from numerous concertgoers that they drove 10 hours to the Paris of the Plains just to watch them to perform. In addition, a dear friend to the band told me that fans have already started following Magic Giant all across the country. The Riot Room was transformed into Magic Giant’s living room that had multi-fabric tapestries and three microphones had fabrics that were drapes via Steven Tyler style. To set the atmosphere, the audience could hear a vintage beach party groove that had similar notes from “Poor Unfortunate Notes” and The Munsters theme song. Around 9:15 PM, Austin, Zang, and Zambricki took the stage with their outstanding drummer Kosta Galanopoulos started a “folk rock revival” that captured the imaginations of their fans. This trio of musicians are impeccable multi-instrumentalists who showcased their amazing talent throughout their set. I believe that concert goers would be thrilled every time that Zang and Zambricki had superb string duets that were sprinkled into the set. Throughout the evening, I gazed throughout the Riot Room audience and I noticed that no concert attendee’s smile vanished from their face. I have watched countless bands who have caught fire during their 15 seconds of fame, but later fizzled into obscurity. However, I truly believe that Magic Giant is going to be a band that is going to not only change the rules in the folk-rock genre, but also inspire the next generation of musicians. The camaraderie between Austin, Zang, and Zambricki is genuine and the three-part harmonies were excellent pieces of ear candy that were sprinkled throughout their set. One of my favorite highlights of the evening would definitely have to be the acoustic circle near the decrescendo of the evening. The Magic Giant trio left the stage and anchored themselves to the middle of the Riot Room audience. They performed “Nothin’ Left,” a song that would immediately give the concertgoers chills. Multiply that feeling with seeing every member in the audience sing the haunting chorus: “I got nothin’ left in this world. Without you, I have nothin’ left at all” and you get a strong connection of brotherhood and sisterhood that was established over the past hour. A key component to Magic Giant’s success is its sturdy fan base. Many fans who shouted their love for the trio all throughout the evening. “Thank you for being here!” one fan proclaimed with joy, while another jubilantly yelled: “Come back!” In addition, two fans who were visiting Kansas City from Australia wanted them to come to Sydney. Even after Magic Giant performed their final song of the night: “Set on Fire,” the audience wanted to hear more from the band.